Making a drawing or measuring your vinyl fence layout is an essential part to your do-it-yourself project. It can be an easy process and we are dedicated to helping you with each step. 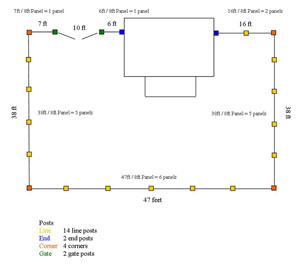 Creating a layout will help you have a better understanding of your vinyl fence project and will ensure that you order the correct amount of materials needed. Please call us with any questions. You may also fax us a copy of your lay-out design and we will look it over and help you figure out the materials needed. Our goal is to help ensure that your vinyl fence order has the right amount of material needed for your particular project.